Ezel, Ky. ? Microphones hang unused next to the pulpit. The Rev. Chris Perkins has no need for them. His voice booms across the Ezel United Presbyterian Church, filling the spiritual center of this sparsely populated Appalachian community with a message of hope and redemption. Perkins, a former congressman and son of the late U.S. Rep. Carl D. Perkins, knows all too well what he’s preaching about. He served 21 months in prison for his part in the House banking scandal of the early 1990s. It was in the midst of the emotional and legal turmoil of his political demise that Perkins turned to religion. And it was in prison that he says he began to realize God was calling him to the ministry. That’s not to say Perkins didn’t second-guess his calling. He had to make certain in his own mind that he was doing the right thing. The Rev. 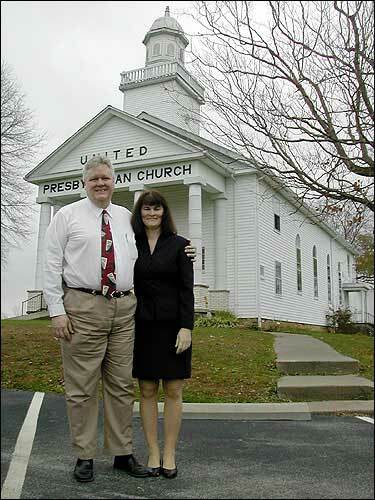 Chris Perkins and his wife, Bunny, stand outside the church where he is pastor in Ezel, Ky. Perkins, a former congressman, served 21 months in prison for his part in a banking scandal in the early 1990s. Perkins took his first step toward the pulpit in 1999 by enrolling at Louisville Seminary, a Presbyterian school where he earned a master’s of divinity degree while serving at Ezel. He was ordained last year. Now, 50, his hair graying, Perkins is the full time pastor at Ezel, easily the largest building in this rural Morgan County community an hour’s drive east of Lexington. He and his wife of four years, Bunny, a Lexington physician, met in church. Robert Motley, a church member for 50 years and owner of a local Frosty Freeze restaurant, said the congregation feels especially fortunate to have Perkins — because of his past rather than in spite of it. Mary Reed, pastor of Chapel Hill Presbyterian Church in Lexington and a former leader at Ezel church, said Perkins communicates well with people, no matter their station in life. Still, this was not the path Perkins was supposed to take. He was expected to one day take over the Democratic political empire his father nurtured for more than three decades in the mountains of eastern Kentucky. With a folksy, bumpkin-like manner that charmed voters and disarmed political foes, the elder Perkins was known for delivering much-needed federal dollars to one of the nation’s poorest districts. As chairman of the House Committee on Education and Labor for 17 years, he made sure the War on Poverty flowed through eastern Kentucky. When Perkins died in 1984 at the age of 71, more than 100 members of Congress attended his funeral in Hindman. Chris Perkins was swept into office largely on the strength of voters’ reverence for his father. He held the congressional seat for eight years, deciding not to seek re-election in 1992 after his role in the House banking scandal was revealed. The House Ethics Committee discovered thousands of overdrafts written by lawmakers at a special bank that existed solely for their benefit. Perkins, beset by financial problems, had written 514 bad checks. After pleading guilty to the charges against him, Perkins lost his license to practice law. He said he had no plans to return to that line of work anyway. Ron Daley, a former adviser to the young congressman, said Perkins felt tremendous pressure to be like his father. He said people who know him well see the difference between his service as congressman, a job chosen for him, and his work as a clergyman, a job he feels passionate about. Wages at the Ezel church are nothing like what Perkins was accustomed to as an attorney and congressman. He is paid $1,000 a month. “I discovered that power, money, prestige really are false. They’re illusions. When you put your faith and your trust in God, there’s a peace that comes that is much more real,” he said.